On 8 March 2018, International Women’s Day, ABColombia pays tribute to all the courageous Human Rights Defenders it works with and those who have been killed for defending the rights of others. Colombian women defenders come from all walks of life; they are indigenous and afro-Colombian women living in remote areas, trade unionists, internally displaced persons (IDPs), human rights lawyers defending victims of the conflict, lesbians and transgender women resisting and against discrimination, journalists, mothers, daughters and sisters of the victims of extrajudicial executions and forced disappearances, and survivors of sexual violence. In the Colombian context women are carrying out a fundamental role as defenders of human rights and “builders of peace and democracy. In 2017, according to Somos Defensores 106 human rights defenders were killed in Colombia. Front Line’s 2017 Report documented 312 HRDs killed globally in 2017. Therefore 1 in every 3 defenders killed worldwide were Colombian; making Colombia the most dangerous country for HRDs to carry out their work. According to a recent presentation to the Inter-American Court of Human Rights impunity for crimes against HRDs is over 90 percent. The UN Verification Mission to Colombia 2018 report expresses concern for the growing number of murders of social leaders, human rights defenders, land restitution advocates and promoters of coca substitution programmes. 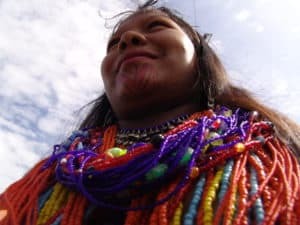 For indigenous women to assume the role of HRDs it is an extension of the task of caring for and defending the lives of sons and daughters and all of their Peoples. Self-protection is viewed from a broad and comprehensive perspective: protection of the individual, the collective (community) and the territory which they share with all beings that inhabit it, as they have done traditionally. A recurring feature of threats directed at women is that they extend to, or contact, their families in order to intimidate and silence them. Those who threaten indigenous women are knowledgeable about indigenous communities, about the courage and love the women have for their children and the sacrifices they are willing to make, and they use this in a strategy of intimidation. Indigenous women use some practices for self-protection that are common to women HRDs, such as, public denouncements shared with their Indigenous networks, the International Community and International organisations; and registered with judicial and state officials. They also use measures that are widely practised to ensure safe mobility, such as, making changes to their normal routines, activating communication networks, working with International and National solidarity organisations whose focus is the protection of women, and in the case of Indigenous Peoples accompaniment from the Guardia Indígena. But perhaps most important for Indigenous women HRDs is the strengthening of traditional protection practices accompanied by traditional medicine and doctors who, from their traditional knowledge, perform rituals in sacred places that are identified in each Pueblo (village) where they perform refreshment and harmonization rituals; rituals that are needed to balance and harmonize the whole person, body and soul and invoke the protective powers of spirits and superior beings who care for life and territory: self-protection is the concept that is the basis of these practices: to be well means you are able to work well. Protection and self-protection of Indigenous women HRDs is an internalised practice, the fact of being indigenous, being part of a people with an identity, a culture and particular practices permeates the protection of HRDs in their own style according to their own culture and traditions of care. 165th Session of the Inter-America Commission of Human Rights, Investigaciones de graves violaciones de derechos humanos y la implementación del Acuerdo de Paz en Colombia: Between 2009 -2016 there was approximately, 90 per cent impunity rate in relation to the crimes against HRDs. This information was given to ABColombia by CODACOP who is a partner organisation of one of ABColombia members. CODACOP work with Nasa Women in Cauca.